London 2012 Lives Up To 'Social Games' Title, In Unwelcome Ways : The Torch The London 2012 Games have been touted as the first Olympics to live fully in the age of social media. But a rash of scandals related to Twitter has put a new mark on the face of the London Games. The stories range from a journalist's suspended account to a tweeting teen who has been arrested. The London Games have lived up to their hype as the first truly "social" Olympics. But social media like Twitter have also brought embarrassments, and even an arrest. 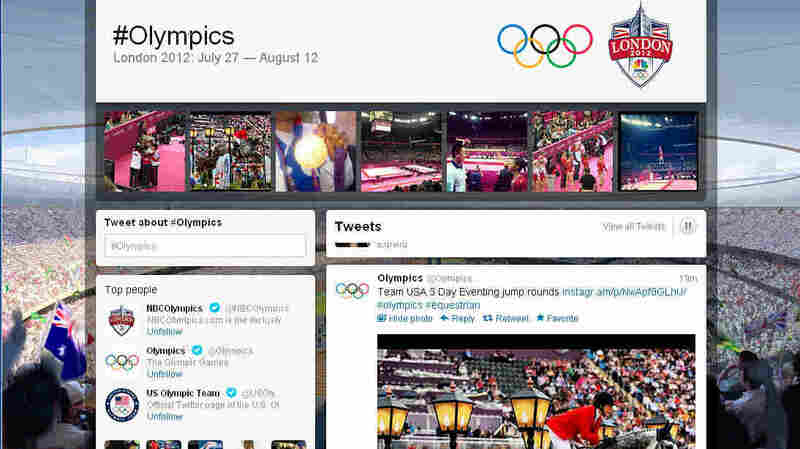 The London 2012 Games have been touted as the first Olympics to live fully in the age of social media. After all, the organization's Twitter feed has nearly 1.4 million followers, as it lists on its special portal for Facebook and other social sites. But a rash of scandals and news related to Twitter has put a new mark on the face of these games. And, as they say, it ain't pretty. First came news that athletes were being sent home for posting racist tweets. Now NBC, Twitter, and British newspaper The Independent are in a row over a journalist's Twitter feed, which was disabled after he posted remarks criticizing NBC and its leadership. Twitter says the suspension was prompted by critical tweets by The Independent's Los Angeles correspondent, Guy Adams, one of which included the email address of NBC executive Gary Zenkel. Adams also helped to popularize the hashtag #NBCFail, as he vented his frustrations with NBC's decision to tape-delay some of the Olympics' biggest moments. "'Your account has been suspended for posting an individual's private information such as private email address, physical address, telephone number, or financial documents,' the company informed Mr Adams. 'It is a violation of the Twitter Rules.'" "'I didn't publish a private email address, just a corporate one, which is widely available to anyone with access to Google and is identical to one that all of the tens of thousands of NBC Universal employees share. It's no more 'private' than the address I'm emailing you from right now.'" Adams amplified his response on his paper's website, with an article titled, "I thought the internet age had ended this kind of censorship." The case is further clouded by the partnership Twitter and NBC are enjoying, as they collaborate in presenting the London Games. In fact, it seems that Twitter alerted NBC to Adams' tweets, not the other way around. "Our social media dept was actually alerted to it by Twitter and then we filled out the form and submitted it," NBC Sports communications vice president Christopher McCloskey tells The Telegraph in an email. The Adams case is far from the only Twitter-versy bubbling during the Summer Olympics. We've reported on the suspension of Greek triple jumper Voula Papachristou from the Olympics, after she posted racist and political views on her Twitter feed. In a similar case, Swiss soccer player Michel Morganella was expelled from the London Games after reportedly tweeting a racist and threatening comment about South Koreans. Morganella, 23, and his team had just lost to South Korea, 2-1. His Twitter account has been deleted. And today, an English teenager's use of Twitter to harangue an Olympian has prompted the teen's arrest. The teen, reportedly a 17-year-old from Dorset, England, used the service to vent anger over British diver Tom Daley, 18, who failed to win a medal in Monday's men's synchronized diving competition. One note to Daley reportedly threatened to drown the diver. The teen then tweeted a message to Daley which read, "You let your dad down I hope you know that." Daley, whose father died of brain cancer last year, then retweeted the message, adding, "After giving it my all...you get idiot's sending me this..."
As of this writing, Daley's message has been retweeted a further 30,089 times. The poster of the original message, identified as rileyy_69, was arrested. But not before he put a message out stating, "10,000 retweets and I'll leave twitter for good." That note has since been retweeted 22,320 times. The status of the account is unclear. It's also unclear what charges, if any, the teen will face. And some are questioning his arrest altogether. In London, Twitter has emerged as a platform for Olympians who see deep economic inequities in the current system. The group, which includes many Americans, are also frustrated that current policies forbid them from promoting the sponsors that helped them train for the Summer Games. Athletes are using the hashtags #WeDemandChange and #Rule40 to make their case. Rule 40 is the Olympics' policy forbidding the promotion of what it calls "ambush marketers" who aren't official sponsors of the games. The restrictions include any images posted on athletes' Twitter or Facebook accounts — which are being actively reviewed by organizers. One of the most vocal athletes has been American runner Sanya Richards-Ross, a favorite in the 400-meter race. She came in for both support and criticism when she spoke out against the restrictions and called for a new debate over paying athletes and letting them promote their sponsors. Some folks found her comments to be unbecoming of an Olympic athlete. Others disagreed — and Richards-Ross herself was one of them. "The Olympics is the greatest platform for most athletes (track, swimming) etc and regulations make it impossible to capitalize on," she wrote. "Other countries fund their Olympians so that they can stay in the sport. US Olympians deserve the same!" In a show of solidarity, many athletes tweeted variations of the same message Sunday: "I am honored to be an Olympian, but #WeDemandChange2012." A recent article in the Kansas City Star lays out the athletes' case, and concludes that IOC President Jacques Rogge "doesn't have to do anything special to make this right. He just has to stop running things like a greedy jerk." Phew. Taken together, that's a big chunk of Olympic news for a service that puts out 140 characters at a time. I've had the idea for this post for a while now, but the story kept growing every day of these Summer Games. It's clear that Rogge, the London Olympic committee, NBC and Twitter have all realized their goal of making London 2012 a truly "social" media experience. But the conversation isn't staying inside the tidy lines they likely sketched out on the drawing-board. In fact, it seems that these Olympics have been even more social than organizers had planned. When the BBC struggled to present accurate information in its report on the men's cycling road race Saturday morning — something the network apologized for — London organizers laid the blame on too many tweets and texts from spectators. That explanation struck some observers as foolish. First, it doesn't make a great deal of technical sense to them. And after all, they say, how could organizers not anticipate what thousands of Twitter and smartphone users would do? As it turns out, that kind of prediction is anything but easy peasy.